In September 1963, seven deans meeting at the annual National Council of Arts in Education (NCAIE) in Pittsburgh, Pennsylvania discussed the need for an organization of fine arts administrators at a luncheon meeting. They identified a lack of respect for the arts and a need to explain arts accomplishments and activities in higher education institutions. 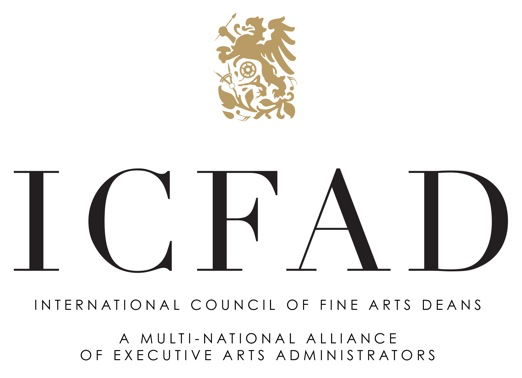 The basis for the existence of the International Council of Fine Arts Deans (ICFAD) was set and it was the first organization to provide a national network of fine arts administrators to advance the arts and bring greater respect for the arts. The following year in conjunction with the NCAIE annual meeting in Oberlin, Ohio, nine deans established the rules for this new organization and named itself the National Council of Fine Arts Deans (NCFAD). Each year this informal group would select a dean to Chair the organization with the primary duties of putting together next year's annual program and communicating with the membership. The organization's annual conference convened at major cultural centers in North American and Europe. These conferences provided and continue to provide discussions and presentations by artists, academic and intellectual leaders and government and foundation officials on topics of interest to the membership. These conferences not only facilitate collaboration and networking among deans, but also provide professional development and exposure to the arts at these cultural centers. ICFAD faced an "international" crisis a few years after its inception. At the annual meeting in 1967, Jules Heller, a founding member of ICFAD, informed the group he recently accepted the position as Fine Arts Dean at York University in Toronto, Canada and subsequently would no longer be able to attend the annual meetings, because he was employed in a "foreign" country. He jokingly remarked that if the group renamed itself to the International Council of Fine Arts Deans, then he would be able to continue to participate. The name change was moved, seconded and unanimously approved. The manner in which ICFAD's name came about prompted ICFAD leadership throughout the years to reevaluate and strengthen the "I" in ICFAD. As ICFAD progressed through the years, it has strived for its international exposure as it pertains to its members. ICFAD has hosted fifteen conferences outside the United States to bring greater exposure of international issues and opportunities to its members. ICFAD has worked jointly in various degrees with its counterpart organizations in other countries such as the Canadian Association of Fine Arts Deans and the European League of Institutes for the Arts. The international members of ICFAD now compose 11% of the entire membership and include institutions from North America, Europe, the Middle East and the Pacific Basin. ICFAD has also published a book and a project which deal with International Exchange programs and transnational initiatives. Until 1978, ICFAD was mainly an informal gathering of deans for fellowship and exchange of ideas, information and professional chitchat. The growth in membership and the growth and complexity of services ICFAD provided was too much for one dean to organize yearly. In 1978, Eugene Bonelli proposed the new organizational structure and the proposal passed. Starting in 1979, ICFAD had elected officers who were responsible to the members and to the actions taken by ICFAD. After submitting ICFAD's organizational documents, the Department of Treasury declared ICFAD to be a nonprofit organization under section 501 (c) 3 of the Internal Revenue Service tax codes. Throughout the years, ICFAD members contributed much time and effort in various initiatives, projects and discussions at national and international conferences to the benefit of ICFAD members. This brought tremendous growth in membership in the 1980s. However, in the 1990s through 2005, there was a stagnation of growth in membership as ICFAD was not able to keep up with the high turnover associated with deans of fine arts schools. In 2006, President Maurice Sevigny led the Board of Directors along with other leaders in the organization to clarify its mission and vision. Through this endeavor, these individual identified ICFAD's to be solely about "Arts Deans Helping Deans." This single organizational idea upon which ICFAD exists and upon which every decision must be based changed the structure and manner in which ICFAD operates. Two years after this identification, ICFAD membership increased by 27% (approximately 400 members) and numerous strategic opportunities for future services, conferences and increased benefits for ICFAD members are now underway. ICFAD's long and illustrious presence in the arts is well documented.